This second-generation Mach 20 RS is remarkably still in the original packaging. The label on the deck points out the "New! Retractable fins". The flyer under the wrapper boasts features such as push-button retractable skegs, black Vacuum-Track rails, a tough slick Surlyn bottom skin, and a flexible strong inner core. 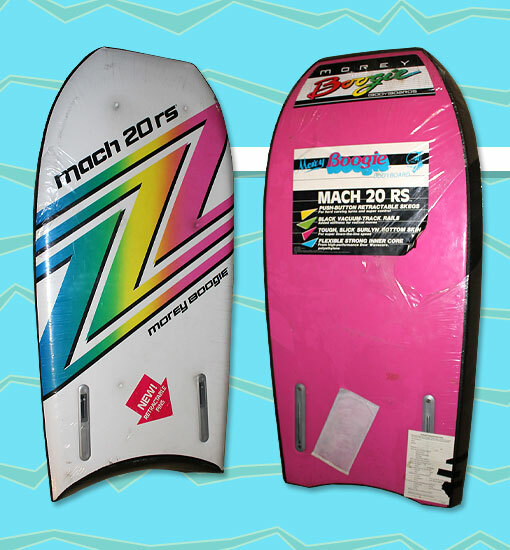 An unusual feature of this particular board is the white deck -- the Mach 20 RS typically featured a silver deck. Photo: Bill Dietz.